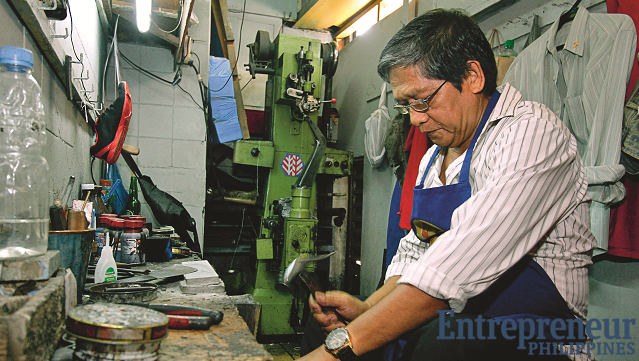 For much of his life, Rodolfo Getes repaired shoes for a living. But in 2012, he became a proud Mr. 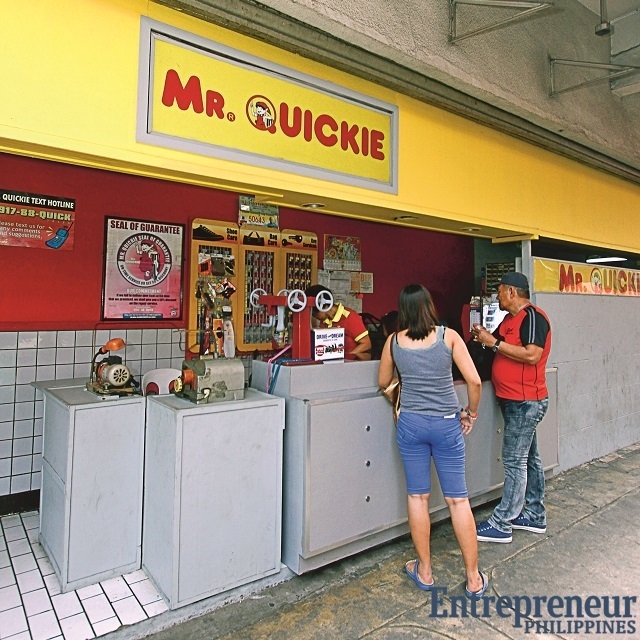 Quickie franchisee, thanks to his boss, Emiliano Caruncho III (the owner of the shoe and bag repair business), who rewards his most loyal employees with a franchise of the famed shoe and bag repair shop. Getes started working at the Mr. Quickie SM North Edsa branch in 1985. Five years later, he was transferred to manage the Isetann Carriedo branch. “At that year’s Christmas party, I was one of the two awardees for best employee. Boss asked me to take over the Isetann branch,” he shared. Twenty-five years later, thanks to the hard work and dedication Getes showed, Caruncho granted the shoe repairman the Isetann branch as a franchise. Loyal employees who have performed well, and have been in the company for about 10 years, are qualified for the program. It was initially a promotion, but it has also become a program for employees who are entitled to early retirement. Employees who are interested in the program are required to apply in the company’s business development department. They are then assessed and recommended to the executive committee for approval. Loan programs are available—applicants can either avail of the in-house loan program, or via the Bank of the Philippine Islands Ka-Negosyo franchise loan. But it was a special case for Getes—it is as if the Isetann Carriedo branch was already handed to him. Back then, employees did not apply for the program; Caruncho handpicked them based on loyalty and work ethics. “When I took over that branch, I did not have to pay for anything. And I was given the equipment and materials I needed to operate. It’s just that, we had to wait out 10 years before the branch became officially mine, under my name, in 2012,” Getes said. Getes has nothing but good words for his boss. “He is genuinely kind to his employees. He really wanted us to have our own franchise. I think that by working hard and being loyal, we are, in a way, returning his kindness,” he pointed out. Now, Getes is living a more comfortable and stable life. “If not for this, I may have been jumping from one job to another,” he said. And true to being a “family business,” Getes’ wife and youngest daughter take active roles in running the branch, even taking over shoe and bag repair when the need arises—after all, they both got training from Getes himself. If it is his family’s needs that made him stay for the job, it is his love for what he does that made him last this long. “To succeed, you have to do really well in your job, and be loyal to the company you work for. You have to be industrious—it’s really hard work! But I love my job, and I love what I do,” he says.